Update: Four days after this column was published, NPR changed its policy. According to a July 2 memo from Sara Goo, an NPR managing editor who oversees digital content, to the newsroom, "opinion content published on NPR.org must now include 'Opinion:' as the first word of the headline." She wrote: "Our content published on NPR.org is distributed beyond the site to third parties, such as Apple News, Flipboard and station websites that may not be able to display the 'Opinion' label that appears on NPR.org story pages. In addition, social media allow people to share headlines without context or the 'Opinion' label." The new headline policy, she said, will remain in place until NPR can address those issues. As public trust in media outlets has been taking a worrying drop in recent years, researchers have been trying to figure out the causes. One element they've zeroed in on: Many Americans have a hard time distinguishing between factual reporting and opinion pieces, as the Pew Research Center has found. Another recent study, the Gallup and Knight Foundation's 2017 Survey on Trust, Media and Democracy, found that Americans estimate that 80 percent of the news they see on social media is biased. And perceived bias, of course, leads back to that issue of trust. News organizations that want to preserve trust in their work need to be vigilant about addressing these issues. Among other things, that means clearly labeling opinion pieces as "Opinion." NPR made that change last July. I praised NPR's new labels at the time of the change. But I am concerned that NPR has not yet completely revised the way it shares opinion pieces on social media, an issue I raised in a column that ran in March. Since that time, NPR has made one good change to address this issue. When NPR's own social media team posts opinion pieces on Facebook, they now do make sure that the headlines include language that makes it clear that it is an "Opinion" piece. But there's still a hole in NPR's system. If a Facebook user wants to share a story from npr.org to her or his personal Facebook page, there's nothing that indicates that it's an opinion piece when it shows up there. Likewise, tweets do not include any "Opinion" labeling unless the person posting the piece adds context in the text of the tweet itself. The issue arose with this opinion piece from the novelist and essayist Monique Truong that ran Sunday. 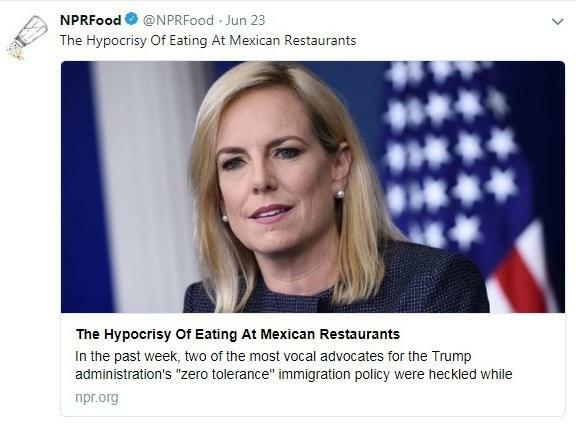 The tweet that went out under the @NPRFood Twitter account was simply the headline on the piece: "The Hypocrisy Of Eating At Mexican Restaurants" followed by a link. Because the system is automated, many NPR member stations posted the same tweet on their own timelines. I'm not surprised that some people saw that headline as representing the opinion of NPR itself, not that of an individual contributor, and immediately raised concerns about bias. Andrea Kissack, NPR's senior supervising editor overseeing the Science Desk, told me that the tweet was sent out automatically and that the autotweet function for @NPRFood has now been turned off until the labeling issue is solved. Other news outlets make clear in their tweets when they are linking to opinion pieces, so NPR should be able to, too. Sara Goo, an NPR managing editor who oversees digital content, told me that she is looking into the issues. She added that she has also had conversations with Facebook about putting a bold "Opinion" label on all such content, from NPR and others, just as there is now a Facebook label for "Breaking News." "It seems like this is an industrywide problem," she said. "People have a hard time determining the difference" between opinion pieces and straight news and "the more helpful we can be the better," she said. NPR does not run a great many opinion pieces but, as I reported before, that amount is slowly growing (although it also got rid of a science opinion blog, 13.7). If it is going to continue to run opinion pieces, then clearly distinguishing them — in tweets and other social media as well as all other aspects of its work — is an urgent necessity.